You have chosen a discontinued Klipsch product. For information on the latest Subwoofers, please click here. This compact and rugged passive subwoofer with an internal multi-tap transformer nicely complements the Klipsch CA-Series and other small to medium sized full-range speaker installations by adding high-impact robust bass. The CA-SW-8T shakes things up and delivers a deep driving sound through an 8-inch long excursion driver that has a high-temperature voice coil attached to an IMG (injection-molded graphite) cone that combines light weight excellent rigidity and water resistance. 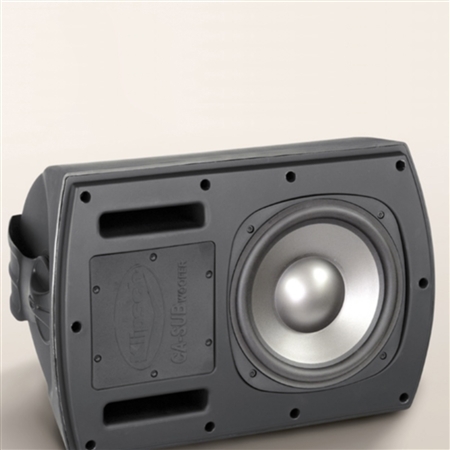 As a result this ported subwoofer is capable of high output while remaining extremely reliable. Maximum continuous output is a remarkable 111dB SPL. And since AES rated sensitivity is 92dB adequate levels can be achieved with modest amplifier power using the CA-SW-8T. This durable subwoofer's paintable weather-and UV-resistant ABS plastic enclosure and powder-coated aluminum grille facilitate easy placement in harsh outdoor environments. For distributed sound system applications the internal multi-tap transformer allows 70-volt 100-volt or pass through 6 ohm operation. Five-way binding-post inputs simplify connections and there is a fixed low-pass crossover at 150Hz. For easy wall or ceiling mounting the CA-SW-8T comes with a C-bracket assembly that attaches to threaded studs in the cabinet with oversized knobs ensuring positive lock. And at just 19 pounds this subwoofer is easy to adjust for optimal coverage. While no longer in production the CA-SW-8T speakers are still owned and listened to by Klipsch fans around the world. To connect with other people who are passionate about audio and interested in Klipsch products visit our open forum bulletin board.